There has long been a pervasive belief in the investment world that smaller companies perform better than larger companies. There is a certain logic to the idea; it seems sensible to believe that once a company has become large, it must have more limited opportunities to grow. The return to the size factor in Barra's US risk model confirms this. Over the years, the size factor in the model has had a negative return on a cumulative basis, indicating that large size, as a factor in and of itself, has generated negative excess return. Despite all this, there is one glaring piece of empirical evidence that requires explanation: the fact that over the 40 years since the inception of the Russell Indices, the large-cap Russell 1000 index has generated a better return than the small-cap Russell 2000 (and with less volatility, too). 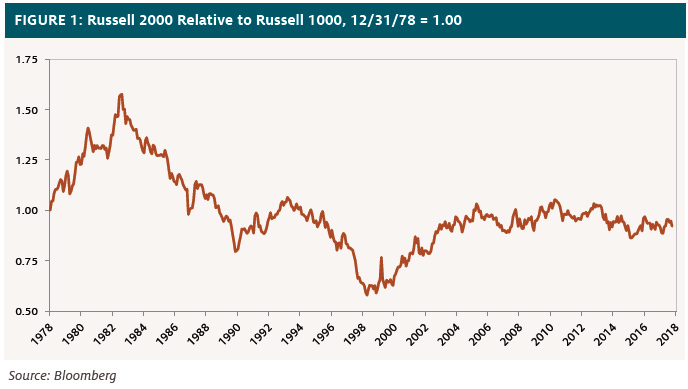 Figure 1 shows the cumulative relative performance of the small-cap Russell 2000 versus the large-cap Russell 1000. If there is a small stock effect, why has the small-cap index underperformed the large-cap index? To understand what is going on here, we need to understand how a company grows large. In Epoch's view, the answer has to do with proper capital allocation. 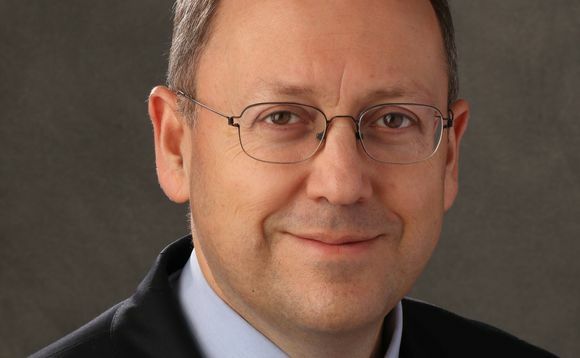 There are only five things that a company can do with its free cash flow: pay a cash dividend, buy back stock, pay down debt, invest in internal projects, or make an external acquisition. How management allocates a company's free cash flow among these five uses should depend on the answer to one key question: if we reinvest the cash flow, either internally or through an acquisition, what will our return on that invested capital be, and how does that compare to our cost of capital? Thus theoretically, companies grow large because they earn high returns on invested capital (ROIC). Is this true in reality? If it is, then larger companies, on average, should earn higher ROIC than smaller companies. Not because being large creates some advantage that enables them to earn higher ROIC; but rather, because the fact that they earn higher ROIC made them grow large. This is something we can test empirically. We started by looking back to see which stocks were in the Russell 1000 and Russell 2000 indices at the end of 2014. We then looked at the ROIC that each company earned in the next three individual years and averaged those numbers. 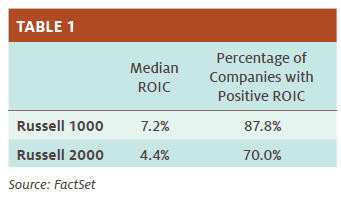 Table 1 shows what the median result was for the stocks in the two indices, as well as the percentage of stocks which had a positive average ROIC. Stocks that were in the Russell 1000 at the end of 2014 had a higher median 3-year average ROIC over the ensuing three years compared to companies in the Russell 2000 (7.2% versus 4.4%). And a higher percentage of Russell 1000 companies had a positive 3-year average as well: almost 88% of the Russell 1000 companies earned a positive average ROIC over the next three years, versus 70% of the companies in the Russell 2000. So larger companies do indeed earn higher ROIC than smaller companies. But was it really the higher ROIC that made the larger companies grow large, as we argue, or was high ROIC a trait they acquired after they became large? To complete the picture, we need to dig a little deeper, mindful of the fact that membership in the Russell 1000 and Russell 2000 is not static; the indices are reconstituted annually to reflect the latest capitalization rankings. 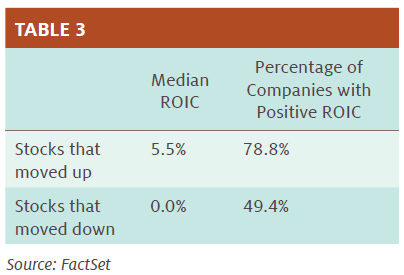 Looking at Table 3 what we find is that stocks that moved up from the Russell 2000 to the Russell 1000 had a median ROIC of 5.5% over this span, and almost 79% of the companies had a positive average ROIC. Compare those numbers to the figures in Table 2 and you will see that these stocks had better results than the larger half of the Russell 2000. Conversely, the stocks that moved down had a median ROIC of 0.0%, and only 49% had a positive average over the three years—not only worse than the smaller half of the Russell 1000, but worse than even the smaller half of the Russell 2000 as well. This seems to confirm the hypothesis that it is not size itself which enables large companies to earn high ROIC. But it also explains how it is possible for there to be a "small stock effect" at the same time that the small-cap index has underperformed the large-cap index. 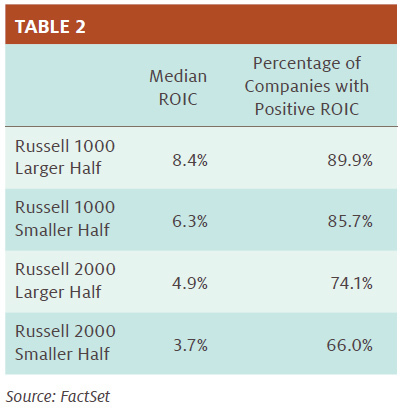 Companies that start small but earn high ROIC grow larger, and leave the Russell 2000 for the Russell 1000. Large companies that earn poor ROIC grow smaller, and fall from the Russell 1000 to the Russell 2000. In other words, the best-performing small-cap stocks, which drive the "small stock effect," leave the small-cap index and are replaced by the worst-performing large (and now shrinking) companies. One key implication is that if you are looking to capture the small stock effect, a passive investment in a small-cap index is not the way to go.